Butternut is also called "white walnut" because of its light-colored wood, which has a natural golden luster that becomes satin-like when polished. The wood is only moderately hard and saws and carves easily. It has been used for furniture, cabinetry, instrument cases, interior woodwork. They have been popular in some areas for making maple-butternut candy. Early settlers used the fruit husks and inner bark to make orange or yellow dye and the root bark provided a laxative. This is a medium-sized native tree with stiff upright branches and a wide-spreading crown. The nuts usually remain on the tree until after leaf fall. The common name refers to the mature nut kernels, which are sweet and oily, like butter. The tree is found most frequently in woods and along streams, on slopes, and on other sites with good drainage. Young trees may grow in considerable competition, but they are shade-intolerant. Can reach heights of 60' to 100'. Related to black walnuts, which are more rounded. 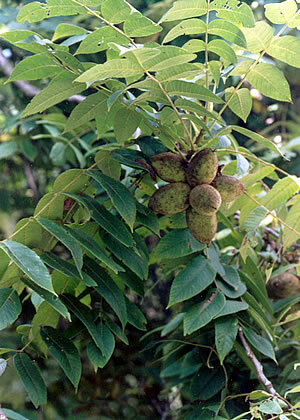 Juglans cinerea is one of the hardiest nut trees. A North American native, the nut has a rich, buttery flavor used in baking, confections, and eating fresh. Additionally the edible nuts of the butternut tree are very rich in proteins, vitamins and minerals. They are a good source of beta-carotene and are rich in omega-3 fatty acids. Butternuts also said to have antioxidant properties that can increase immunity and decrease the risk of cancer.